The Shinar Directive serves as a kingdom intelligence briefing for God’s people in the 21st Century. In this landmark book, Christians will discover the secret history of humanity that the Luciferian Elite have hidden from the masses. 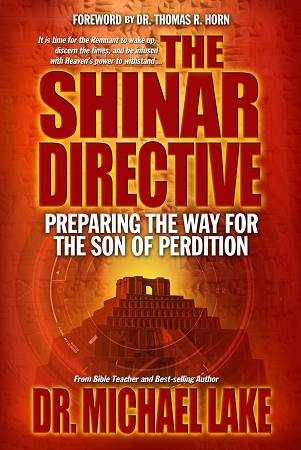 The Shinar Directive reveals: In the ancient plains of Shinar, an evil was born: the first world king, the prototype transhuman, the ultimate despot, the Son of Perdition – Nimrod. In Babylon, the Son of Perdition devised the Shinar Directive: the enslaving of humanity and the war against the God of Heaven. God’s intervention at the Tower of Babel only delayed his hellish plans. The Luciferian Elite now control three key circles of influence in the world: financial, political, and religious. However, controlling these three systems was not enough. The laborers of Mystery Babylon have been quietly planning and waiting for thousands of years for the releasing of the Watchers of Genesis 6. Now armed with developing Watcher technologies, the Elite will use Transhumanism and mind control to build the Joel Chapter Two Army: the Army of the Antichrist. We are beginning to realize that the Mark of the Beast and the Image of the Beast are much more than we could have ever imagined: beyond an implant, beyond a physical mark – it will affect DNA and who we are at a molecular level! As the powers of Mystery Babylon gather to create the new Tower of Babel and to prepare for the Son of Perdition’s return, Heaven is issuing a clarion call to the Remnant: know the strategies of the enemy, untangle yourself from them, and become the victorious Church! Heaven’s Jewish Apostle of Love, the Apostle John, reveals both the coming conflict in his “Book of Revelation” and provides the ancient Hebraic wisdom encoded in First John to equip the bondservants of Messiah with the tools of the Kingdom to overcome the Shinar Directive!